Round 4 brings us another giveaway for one of our lucky quilt-along-ers! This time it's for a sewing caddy/organizer/travel thingy that was designed and sewn by me. There is also a tutorial posted here on my blog that will show you step-by-step how to make your own, if you should choose to do so. The needle/pin holder flips up to keep sharp pointy things under cover. Removable trash bag and gathered pocket on this side. To help you with your hand sewing, here's your chance to win a sewing caddy that folds up and keeps little hands (or paws) out of it when you're not using it. 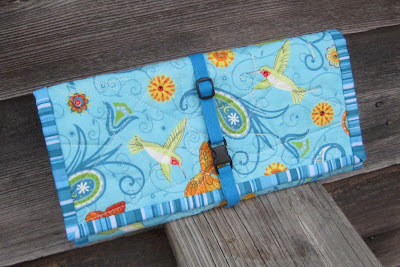 I made this out of Fresh fabric, the little hummingbirds and butterflies are sooo sweet! On the outside of the caddy, I enhanced a few strategic places with hot-fix Swarovski crystals, like on the ruby throats and some flower centers, a little glitz never hurt anybody, right?! Right! If you've been taking part in the Old Red Barn Company's quilt along at Flickr, then you know about the newest round we're doing- the Circles, Curves and More quilt, blogged about here at Pottery and Everything Else, created, taught and led by the fabulous Heidi Elliot or as we like to call her, Hats! This week we're learning how to piece the crazy 9 patch. I'm excited to get started. Happy Quilting and good luck, people! FIRST!! Heh - it's the little things, eh? I could have used one of these this evening! I've just spent 2 hours tieing off, stitching in and snipping loose threads from Mam's Christmas quilt. Little red bits all over the living room!! Still, it kept me entertained more than Tom Cruise being all Mission:Impossible-ish. I love your sewing caddy. I was looking at your tutorial the other day and plotting sewing one for use when I do hand applique but I would really love to win one made by you! Thanks for the giveaway and the chance to win. Thank you Flossie!!! 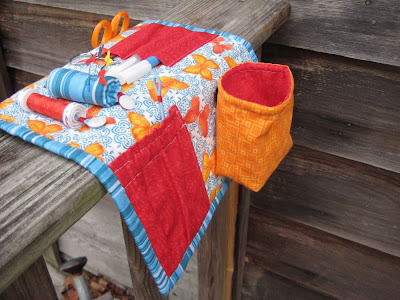 This is sew cool and I love the cute and bright fabrics used. I can just see it draped over the arm of my sofa which is where I usually leave my bits of thread. Oh my!!!! What a wonderful caddy, I can just picture it next to me while I'm sewing in front of the TV!! I enjoy your blog and your comments on the quilt a long site. 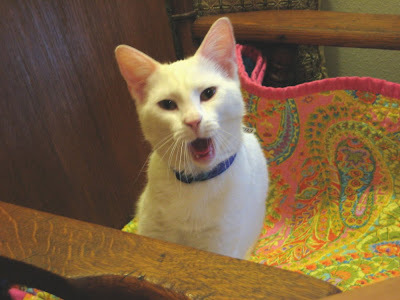 I love to hear all about he adventures of Miss Nosey Parker too. Thanks for hosting this cool giveaway! How nice--a really useful thing. How fun to read all you comments on the ORBQ4 discussion. Thanks for all the entertainment! Flossie this is just super pretty! I love these colors. You are so cool to put this up. Oh I'd just love to win this! You are so generous for offering this giveaway! How stinkin' cool is that??!! Thanks for the opportunity to win one!! That would be so useful as I start my Josephs Coat quilt that is alot of applique. i just love this caddy so fingers crossed. Fantastic! Someday my number will come up! I would take the cat too... :) we just got a new kitten "pumpkin". An orange tabby of course. What a cute sewing caddy giveaway...I want to win it...thanks for the opportunity...is that your little kitty? A Cutie Pie! Me Me pick Me MEEEEEEEE! Crazy I know but I want one REALLY BAD! The kitty too. Oh!! I would love that! That way, my furry and non furry babies could hopefully leave my stuff alone! HA!! That is the cutest portable sewing caddy ever! I love the little threadcatcher. This would come in so handy when embroidering on blocks - so easy to take it everywhere! How cute is that?! Seriously! You are so clever! This is the cutest sewing caddy and a perfect idea to keep the nosey cats out of our stuff. Thanks for having this fun giveaway. Wow, so sweet! What a perfect idea for keeping everything organized. Right now I have all my pins, thread, scissors, etc. on top of the piano to keep them out of little hands. Thanks! Flossie that is sure one great giveaway I love it. Thanks for the chance to win it is to cute with the humming birds. It would keep my 2 yr old grandson out of my stuff. What a great caddy!! We're moving back to Oz shortly. sniffle/yay! That is so cute! I totally need one of those to keep my stuffs in order when I sew on the couch. Count me in! DEAR Flossie! How cool to get something from you in the mail! If I don't win (come on Nosey), my life goal will be to get something from you! I love the hummingbirds!! That looks so fantastic! Thanks for giving it away! I will have to mark and print your tutorial as if I do not win I am making one!! Thanks Flossie! what a great idea... and the fabric choice is great. thanks for giving it away. That is so cool!! I really need one of these. What a fun giveaway - thanks! Flossie! Aren't you so generous! I'd love to win this beautiful, useful caddy. Hi to your white random "winner picker." Oh, goodness, that is adorable! I would love to get me one of those! Wish me luck! Oh my gosh I need to get in this one! I would love to have this little gem for the time when I start my hand quilting (so I don't sit on something sharp while on the couch) or when I find a little furry baby to adopt. I'm starting to think that just might be a good idea, since so many little ones (or mature ones) need homes. Anyway, please count me in and maybe NP will pick ME!! NP you are a little talker now huh? You are certainly getting cuter and cuter every time your sweet Mom takes a picture of you! That sewing caddy is amazing! I have never seen anything like it (but I am new to sewing).You have such great fabrics too! You always find the cutest fabrics that I have never seen... Oh, I would be so happy if your little friend picked me! What a wonderful giveaway. I would love to go into the draw. I am following the Quilt along in my dreams, I just don't have the time ATM but am taking notes. I have this organizer bookmarked to make. Such a clever design! So cute! I think I'll be making one of these! Your organizer is wonderful, please enter me in your drawing. Found you through another blog and love your little owls on the previous post. Just darling. Can I enter if I'm not doing the quilt-along? I absolutely love this. A place to put all those needles,buttons, snaps,scissors,threads,and scrap pockets, makes me want to do one for all my stuff,too. Such a flare of fabric colors and flavored stitchery makes sewing fun! ASPEN LOGGER. Best caddy I've seen. 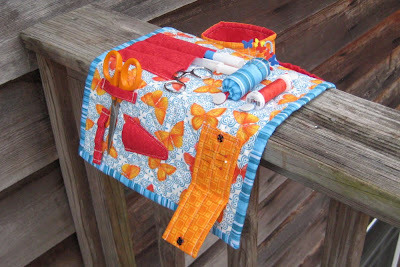 You thought of a place for every notion you might need when sewing. Your choice of colors is very attractive. Your choices for fabrics are always the best. You really do have incredible talent for putting colors together. Thanks again for all the lovely compliments! That sewing caddy is cute! and I love the fabric the cat is sitting on too!